This chapter presents geometric design guidelines for signalized intersections based on a review of technical literature and current design policy in the United States. Geometric design of a signalized intersection involves the functional layout of travel lanes, curb ramps, crosswalks, bike lanes, and transit stops in both the horizontal and vertical dimensions. Geometric design has a profound influence on roadway safety; it shapes road user expectations and defines how to proceed through an intersection where many conflicts exist. In addition to safety, geometric design influences the operational performance for all road users. Minimizing impedances, eliminating the need for lane changes and merge maneuvers, and minimizing the required distance to traverse an intersection all help improve the operational efficiency of an intersection. The needs of all possible road users (see chapter 2) must be considered to achieve optimal safety and operational levels at an intersection. At times, design objectives may conflict between road user groups; the practitioner must carefully examine the needs of each user, identify the tradeoffs associated with each element of geometric design, and make decisions with all road user groups in mind. Preventing left turns from driveways or minor streets based on safety or operational concerns. Designing channelization to prevent wrong way movements onto freeway ramps, one-way streets, or divided roadways. Designing approach alignment to discourage undesirable movements. Figure 10 shows how a raised median can be used to restrict undesirable turn movements within the influence of signalized intersections. Figure 10. The photograph shows a raised median that restricts left-turn egress movements from a driveway located between two signalized intersections. 2. Define desirable paths for vehicles. The approach alignment to an intersection as well as the intersection itself should present the roadway user with a clear definition of the proper vehicle path. This is especially important at locations with “unusual” geometry or traffic patterns such as highly skewed intersections, multileg intersections, offset-t intersections and intersections with very high turn volumes. Clear definition of vehicle paths can minimize lane changing and avoid “trapping” vehicles in the incorrect lane. Avoiding these undesirable effects can improve both the safety and capacity at an intersection. Figure 11 shows how pavement markings can be applied to delineate travel paths. Figure 11. Pavement markings can be used to delineate travel lanes within wide intersections as shown in the photograph. 3. Encourage safe speeds through design. An effective intersection design promotes desirable speeds to optimize intersection safety. The appropriate speed will vary based on the use, type, and location of the intersection. On high-speed roadways with no pedestrians, it may be desirable to promote higher speeds for turning vehicles to remove turning vehicles from the through traffic stream as quickly and safely as possible. This can be accomplished with longer, smooth tapers and larger curb radii. On low-speed roadways or in areas with pedestrians, promotion of lower turning speeds is appropriate. This can be accomplished with smaller turning radii, narrower lanes, and/or channelization features. These are illustrated in figure 12.
depending on the speed environment. 4. Separate points of conflict where possible. Separation of conflict points can ease the driving task while improving both the capacity and safety at an intersection. The use of exclusive turn lanes, channelized right turns, and raised medians as part of an access control strategy are all effective ways to separate vehicle conflicts. Figure 13 illustrates how the addition of a left-turn lane can reduce conflicts with through vehicles traveling in the same direction. (a) Major street with shared left-through lane causes through vehicles to queue behind left-turning vehicles. (b) Major street with dedicated left-turn lane removes left-turning vehicles from the paths of through vehicles. both left and through traffic. 5. Facilitate the movement of high-priority traffic flows. Accommodating high-priority movements at intersections addresses both driver’s expectations and intersection capacity. The highest volume movements at an intersection typically define the intersection’s high-priority movements, although route designations and functional classification of intersecting roadways may also be considered. In low-density suburban and rural areas, it may be appropriate to give priority to motor vehicle movements; however, in some urban locations, pedestrians and bicyclists at times may be the highest priority users of the road system. Figure 14 shows an intersection where double left and right turn lanes are used to facilitate high-volume turning movements. Figure 14. The photo shows how double left-turn and double right-turn lanes can be used to accommodate high-priority movements. 6. Design approaches to intersect at near right angles and merge at flat angles. Roadway alignments that cross as close to 90 degrees as practical can minimize the exposure of vehicles to potential conflicts and reduce the severity of a conflict. Skewed crossings produce awkward sight angles for drivers, which can be especially difficult for older drivers. Skewed crossings also result in additional distance for vehicles to traverse the intersections. This additional distance should be considered when developing the timing for a signal, as it may require the need for additional all-red clearance time. Figure 15 shows how a skewed intersection approach can increase the distance to clear the intersection for pedestrians and vehicles. (a) Intersection skew at 90 degrees. (b) Intersection skew at 75 degrees. (c) Intersection skew at 60 degrees. width and pedestrian crossing distance. 7. Facilitate the desired scheme of traffic control. The design of a signalized intersection should attempt to maximize traffic safety and operations while providing operational flexibility. Lane arrangements, location of channelization islands, and medians should be established to facilitate pedestrian access and the placement of signs, signals, and markings. 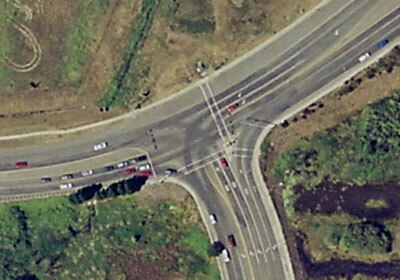 Consideration of these “downstream” issues as part of design can optimize the operation of an intersection. Providing exclusive left-turn bays that can accommodate left-turn movements can improve operations and safety while providing flexibility to accommodate varying traffic patterns. Positive offset left-turn lanes can improve sight distance for left-turning movements but may prohibit U-turns if insufficient width is available. Reversible lanes may be appropriate for arterials that experience heavy directional peaks in traffic volumes during commuter periods. 8. Accommodate decelerating, slow, or stopped vehicles outside higher speed through traffic lanes. Speed differentials between vehicles in the traffic stream are a primary cause of traffic crashes. Speed differentials at intersections are inherent as vehicles decelerate to facilitate a turning maneuver. The provision of exclusive left- and right-turn lanes can improve safety by removing slower moving turning vehicles from the higher speed through traffic stream and reducing potential rear-end conflicts. In addition, through movements will experience lower delay and fewer queues. 9. Provide safe refuge and wayfinding for bicyclists and pedestrians. 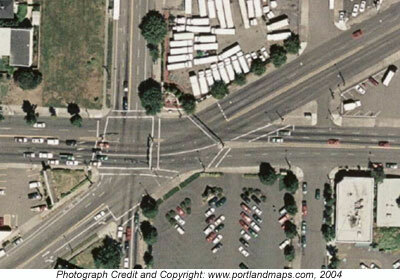 Intersection design must consider the needs of roadway users other than motorists. Intersection channelization can provide refuge and/or reduce the exposure distance for pedestrians and bicyclists within an intersection without limiting vehicle movement. The use of raised medians, traffic islands, and other pedestrian-friendly treatments should be considered as part of the design process. Wayfinding may also be an issue, particularly at intersections with complicated configurations. While the geometry of various types of intersections may vary, the complexity of an intersection increases with an increasing number of approach legs to the intersections, as shown in figures 16 and 17. The latter shows the number and type of conflicts that occur at intersections with three and four legs, respectively. The number of potential conflicts for all users increases substantially at intersections with more than four legs. Note that many potential conflicts, including crossing and merging conflicts, can be managed (but not eliminated) at a signalized intersection by separating conflicts in time. Figure 16. The photograph illustrates a multileg intersection. Figure 17. Potential conflicts at intersections with three and four legs. The angle of intersection of two roadways can influence both the safety and operational characteristics of an intersection. Heavily skewed intersections not only affect the nature of conflicts, but they produce larger, open pavement areas that can be difficult for drivers to navigate and pedestrians to cross. 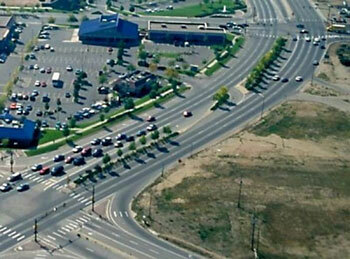 Such large intersections can also be more costly to build and maintain. Difficulty in accommodating large vehicle turns. Additional pavement, channelization, and right-of-way may be required. The increase in pavement area poses potential drainage problems and gives smaller vehicles more opportunity to “wander” from the proper path. Vehicles crossing the intersection are more exposed to conflicts. This requires longer clearance intervals and increased lost time, which reduces the capacity of the intersection. Pedestrians and bicyclists are exposed to vehicular traffic longer. Longer pedestrian intervals may be required, which may have a negative impact on the intersection’s capacity. Pedestrians with visual disabilities may have difficulty finding their way to the other side of the street when crossing. Driver confusion may result at skewed crossings. Woodson, Tillman, and tillman found that drivers are more positive in their sense of direction when roadways are at right angles to each other. (42) Conversely, drivers become more confused as they traverse curved or angled streets. The approach to a signalized intersection should promote awareness of an intersection by providing the required stopping sight distance in advance of the intersection. This area is critical as the approaching driver or bicyclist begins to focus on the tasks associated with navigating the intersection. Avoid approach grades to an intersection of greater than 6 percent. On higher design speed facilities (80 km/h (50 mph) and greater), a maximum grade of 3 percent should be considered. Avoid locating intersections along a horizontal curve of the intersecting road. Strive for an intersection platform (including sidewalks) with cross slope not exceeding 2 percent, as needed for accessibility. Intersection corners that are designed appropriately accommodate all users. The selection of corner radius and curb ramp design should be guided by pedestrian crossing and design vehicle needs at the intersection. In general, it is recommended to provide a pedestrian crossing that is as near to perpendicular to the flow of traffic as practical with no intermediate angle points. This keeps pedestrian crossing time and exposure to a minimum, which may allow more efficient operation of the signal. It also aids visually impaired pedestrians in their wayfinding task by eliminating changes in direction that may not be detectable. Corner radii should also be designed to accommodate the turning path of a design vehicle to avoid encroachment on pedestrian facilities and opposing lanes of travel. Design vehicle. 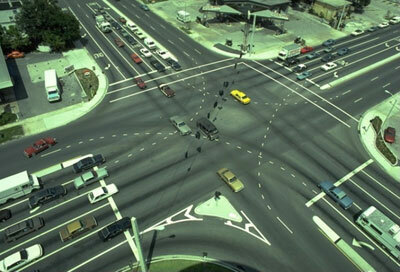 Selection of a design vehicle should be based on the largest vehicle type that will regularly use an intersection. Often, a design vehicle is mandated by agency policy, regardless of vehicle mix. In certain instances, more than one design vehicle may be appropriate depending on traffic patterns. Angle of intersection. Large intersection skew angles make turning maneuvers more difficult, particularly for larger vehicles. This has the potential to increase the overall size of the intersection, making drainage difficult and increasing signal clearance intervals to clear the intersection. Pedestrians and bicyclists. In areas of high pedestrian and bike use, smaller radii are desirable to reduce turning speeds and decrease the distance for pedestrians and bikes to cross the street. Constraints. Multicentered curves or simple curves with tangent offsets can be used to better match the turn path of the design vehicle and reduce required right-of-way. Curb ramps provide access for people who use wheelchairs and scooters. Curb ramps also aid people with strollers, luggage, bicycles, and other wheeled objects in negotiating the intersection. The basic components of a curb ramp, including ramp, landing, detectable warning, flare, and approach, are diagrammed in figure 18. The ADAAG require that curb ramps be provided wherever an accessible route crosses a curb, which includes all designated crosswalks at new and retrofitted signalized intersections. (33) While curb ramps increase access for mobility-impaired pedestrians, they can decrease access for visually impaired pedestrians by removing the vertical curb face that provides an important tactile cue. This tactile cue is instead provided by a detectable warning surface placed at the bottom of the ramp, which provides information on the boundary between the sidewalk and roadway. Figure 18. Curb ramp components. Table 9, adapted from FHWA’s Designing Sidewalks and trails for Access, Part 2: Best Practices Design Guide, provides a summary of recommended fundamental practices for curb ramp design, along with the rationale behind each practice. (34) A designer can apply these principles in designing intersections in a wide variety of circumstances. Table 9. Summary of best practices for curb ramp design and associated rationale. Provide a level maneuvering area or landing at the top of the curb ramp. Landings are critical to allow wheelchair users space to maneuver on or off the ramp. Furthermore, people who are continuing on the sidewalk will not have to negotiate a surface with a changing grade or cross slope. Clearly identify the boundary between the bottom of the curb ramp and the street with a detectable warning. Design ramp grades that are perpendicular to the curb. Assistive devices for mobility are unusable if one side of the device is lower than the other or if the full base of support (e.g., all four wheels on a wheelchair) is not in contact with the surface. This commonly occurs when the bottom of a curb ramp is not perpendicular to the curb. Place the curb ramp within the marked crosswalk area. Pedestrians outside of the marked crosswalk are less likely to be seen by drivers because they are not in an expected location. Avoid changes of grade that exceed 11 percent over a 610 mm (24 inch) interval. Severe or sudden grade changes may not provide sufficient clearance for the frame of the wheelchair, causing the user to tip forward or backward. Design the ramp so that it does not require turning or maneuvering on the ramp surface. Maneuvering on a steep grade can be very hazardous for people with mobility impairments. Provide a curb ramp grade that can be easily distinguished from surrounding terrain; otherwise, use detectable warnings. 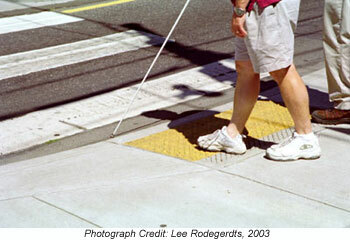 Gradual slopes make it difficult for people with visual impairments to detect the presence of a curb ramp. Design the ramp with a grade of 7.1 ±1.2 percent. Do not exceed 8.33 percent (1:12). Shallow grades are difficult for people with vision impairments to detect, but steep grades are difficult for those using assistive devices for mobility. Design the ramp and gutter with a cross slope of 2.0 percent. Ramps should have minimal cross slope so users do not have to negotiate a steep grade and cross slope simultaneously. Provide adequate drainage to prevent the accumulation of water or debris on or at the bottom of the ramp. Water, ice, or debris accumulation will decrease the slip resistance of the curb ramp surface. Provide transitions from ramps to gutter and streets that are flush and free of level changes. Maneuvering over any vertical rise such as lips and defects can cause wheelchair users to propel forward when wheels hit this barrier. Align the curb ramp with the crosswalk so there is a straight path of travel from the top of the ramp to the center of the roadway to the curb ramp on the other side. Where curb ramps can be seen in advance, people using wheelchairs often build up momentum in the crosswalk in order to get up the curb ramp grade (i.e., they “take a run at it”). This alignment may be useful for people with vision impairments. Provide clearly defined and easily identified edges or transitions on both sides of the ramp to contrast with the sidewalk. Clearly defined edges assist users with vision impairments to identify the presence of the ramp when it is approached from the side. Source: Adapted from reference 34, table 7-1. Perpendicular curb ramps with flares and a level landing. Perpendicular curb ramps with returned curbs and a level landing. Two parallel curb ramps on a wide turning radius. Two parallel curb ramps with a lowered curb. Two combination curb ramps on a corner with a wide turning radius. A curb extension with two perpendicular curb ramps with returned curbs and level landings. Figure 19. Examples of preferred designs. Perpendicular curb ramps, oriented perpendicular to the curb, on a corner with a wide turning radius. Diagonal curb ramp with flares and a level landing, in addition to at least 1.22 m (48 inch) of clear space. Diagonal curb ramp with returned curbs, a level landing, and sufficient clear space in the crosswalk. Single parallel curb ramp with at least 1.22 m (48 inch) clear space. Figure 20. Examples of acceptable curb ramp designs. Perpendicular curb ramps without a landing. On a corner with a wide turning radius, curb ramps are aligned parallel with the crosswalk. Diagonal curb ramp with no clear space or no level area at the bottom of the curb ramp. Diagonal curb ramps without a level landing. Figure 21. Examples of inaccessible designs. The ADAAG require that a detectable warning surface be applied to the surface of the curb ramps and within the refuge of any medians and islands (defined in the ADAAG as “hazardous vehicle areas”) to provide tactile cues to individuals with visual impairments. (33) Detectible warnings consist of a surface of truncated domes built in or applied to walking surfaces; the domes provide a distinctive surface detectable by cane or underfoot. This surface alerts visually impaired pedestrians of the presence of the vehicular travel way, and provides physical cues to assist pedestrians in detecting the boundary from sidewalk to street where curb ramps and blended transitions are devoid of other tactile cues typically provided by a curb face. At the face of a curb ramp and within the refuge area of any median island, a detectable warning surface should be applied as shown in figure 22. The detectable warning surface begins at the curb line and extends into the ramp or pedestrian refuge area a distance of 610 mm (24 inches). For a median island, this creates a minimum clear space of 610 mm (24 inches) between the detectable warning surfaces for a minimum median island width of 1.8 m (6 ft) at the pedestrian crossing. This is a deviation from the requirements of the ADAAG (§4.29.5), which requires a surface width of 915 mm (36 inches). However, this deviation is necessary to enable visually impaired pedestrians to distinguish where the refuge begins and ends from the adjacent roadway where the minimum 1.8 m (6 ft) refuge width is provided. Table 10 summarizes ADAAG requirements for detectable warning surfaces. Figure 22.This crosswalk design incorporates the use of detectable warning surfaces into the curb ramps to facilitate navigation by a visually impaired pedestrian. Table 10. Requirements for detectable warning surfaces. These guidelines are in the rulemaking process and are therefore not enforceable. They will be incorporated into the ADAAG; however, the recommendations listed below are subject to revision prior to the issuance of a final rule. Raised truncated domes aligned in a square grid pattern. Nominal diameter: 23 mm (0.9 inches). Nominal height: 5 mm (0.2 inches). Base diameter: 23 mm (0.9 inches) minimum, 36 mm (1.4 inches) maximum. Ratio of top diameter to base diameter: 50% minimum, 65% maximum. Height: 5 mm (0.2 inches). Nominal center-to-center spacing: 60 mm (2.35 inches). Center-to-center spacing: 41 mm (1.6 inches) minimum, 61 mm (2.4 inches) maximum. Base-to-base spacing: 16 mm (0.65 inches) minimum, measured between the most adjacent domes on square grid. Detectable warning surfaces must contrast visually with adjacent walking surfaces either light-on-dark, or dark-on-light. The material used to provide contrast must be an integral part of the walking surface. At curb ramps: The detectable warning must extend the full width and depth of the curb ramp. At curb ramps, landings, or blended transitions connecting to a crosswalk: Detectable warning surfaces must extend 610 mm (24 inches) minimum in the direction of travel and the full width of the curb ramp, landing, or blended transition. The detectable warning surface must be located so that the edge nearest the curb line is 150 mm (6 inches) minimum and 205 mm (8 inches) maximum from the curb line. Within median islands, the boundary between the curbs must be defined by a continuous detectable warning 915 mm (36 inches) wide, beginning at the curb line. Within median islands, the detectable warning surface must begin at the curb line and extend into the pedestrian refuge a minimum of 610 mm (24 inches). Detectable warnings must be separated by a minimum length of walkway of 610 mm (24 inches) without detectable warnings. A driver’s ability to see the road ahead and other intersection users is critical to safe and efficient use of all roadway facilities, especially signalized intersections. Stopping sight distance, decision sight distance, and intersection sight distance are particularly important at signalized intersections. Table 11. Design values for stopping sight distance. Source: Reference 3, exhibit 3-1. Decision sight distance is “the distance needed for a driver to detect an unexpected or otherwise difficult-to-perceive information source or condition in a roadway environment that may be visually cluttered, recognize the condition or its potential threat, select an appropriate speed and path, and initiate and complete the maneuver safely and efficiently.”(3, p. 115) Decision sight distance at intersections is applicable for situations where vehicles must maneuver into a particular lane in advance of the intersection (e.g., alternative intersection designs using indirect left turns). Table 12. Design values for decision sight distance for selected avoidance maneuvers. Avoidance Maneuver A: Stop on rural road, time (t) = 3.0 s.
Avoidance Maneuver B: Stop on urban road, t = 9.1 s.
Avoidance Maneuver C: Speed/path/direction change on rural road, t = 10.2 s to 11.2 s.
Avoidance Maneuver D: Speed/path/direction change on suburban road, t = 12.1 s to 12.9 s.
Avoidance Maneuver E: Speed/path/direction change on urban road, t = 14.0 s to 14.5 s.
Source: Reference 3, exhibit 3-3. Intersection sight distance is the distance required for a driver without the right of way to perceive and react to the presence of conflicting vehicles and pedestrians. Intersection sight distance is traditionally measured through the determination of a sight triangle. This triangle is bounded by a length of roadway defining a limit away from the intersection on each of the two conflicting approaches and by a line connecting those two limits. Intersection sight distance should be measured using an assumed height of driver’s eye of 1,080 mm (3.5 ft) and an assumed height of object of 1,080 mm (3.5 ft). (3) The area within the triangle is referred to as the clear zone and should remain free from obstacles. The first vehicle stopped on an approach should be visible to the first driver stopped on each of the other approaches. Vehicles making permissive movements (e.g., permissive left turns, right turns on red, etc.) should have sufficient sight distance to select gaps in oncoming traffic. Permissive left turns should satisfy the case for left turns from the major road (Case F, reference 3). Right turns on red should satisfy the case for a stop-controlled right turn from the minor road (Case B2, reference 3). Pedestrian facilities should be provided at all intersections in urban and suburban areas. In general, design of the pedestrian facilities of an intersection with the most challenged users in mind—pedestrians with mobility or visual impairments should be done. The resulting design will serve all pedestrians well. In addition, the ADA requires that new and altered facilities constructed by, on behalf of, or for the use of State and local government entities be designed and constructed to be readily accessible to and usable by individuals with disabilities. (33) Therefore, it is not only good practice to design for all pedestrian types, but it is also a legal requirement. Keep corners free of obstructions to provide enough room for pedestrians waiting to cross. Maintain adequate lines of sight between drivers and pedestrians on the intersection corner and in the crosswalk. Ensure curb ramps, transit stops (where applicable), pushbuttons, etc. are easily accessible and meet ADAAG design standards. Clearly indicate the actions pedestrians are expected to take at crossing locations. Design corner radii to ensure vehicles do not drive over the pedestrian area yet are able to maintain appropriate turning speeds. Ensure crosswalks clearly indicate where crossings should occur and are in desirable locations. Provide appropriate intervals for crossings and minimize wait time. Limit exposure to conflicting traffic, and provide refuges where necessary. Ensure the crosswalk is a direct continuation of the pedestrian's travel path. Ensure the crossing is free of barriers, obstacles, and hazards. Bike lanes and bike lane transitions between through lanes and right turn lanes. Separate facilities if no safe routes can be provided through the intersection itself.